In 1973, Michael D. Coe, in The Maya Scribe and His World, published a cream colored, covered vase as number 52. The vase is rather unusual as it has an inscription of 10 glyphs in 5 sections, incised on the cover and body. Coe remarks, "My guess is that the vase text contains a name..."
Marc Zender has been kind enough to present us with a discussion and translation of the text. I am happy to publish Marc's letter as I received it. Marc and I hope that we can elicit some discussion based on this new translation. difficulties of interpretation is certainly worthy of some discussion here. 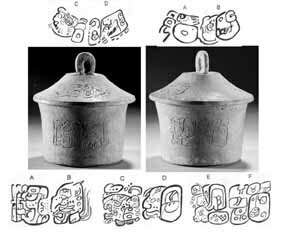 favour of the inscriptions of both lid and vessel forming a single text. extended glyphic nametag which follows seems certain. B'ahlam Ni'. He is the ? of the Lord of Chal-'a"
lengthy name whose meaning can be rendered more or less as "The Hot One, Raingod Hawk, Mouth of the Jaguar". Chaahk Muwaahn Ti' B'ahlam Ni' has yet to turn up on any monuments. k'uhul- prefix argues that Chal-'a may have been a relatively small center. sites could be named after important gods like Chaahk and K'ihnich.